Ah, we see you're the roaming type, a worry-free wayfarer out to see what the world holds in store. You may have traveled the country, heck, maybe even the world, in that rolling residence of yours, but you haven't seen a place like this. Towering crimson rock formations reflect off the cerulean surface of Lake Havasu, the sun shines more than 300 days a year and the folks are friendly as can be. 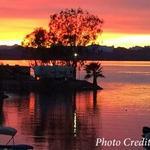 Lake Havasu trips offer more than just a pretty picture, though. Park your home away from home at one of the many Lake Havasu, Arizona campgrounds and then head out for an adventure or two. Zip across the lake on a boat, jet ski, kayak or any other watercraft you can imagine, head off-road for hiking and four-wheeling fun or take to the skies in a hot air balloon, seaplane or ultralight. 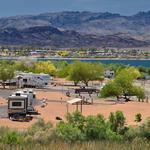 15 miles south of Lake Havasu City, this 2,000-acre park offers tent and RV camping with great water views and access, as well as access to boat camping spots on the lake and day-use offering hiking trails and a white sand beach. 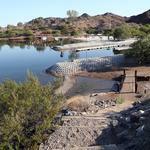 Lake Havasu's oldest RV Park and campground is located on the Island just across the London Bridge. The view is compelling and the amenities are numerous for RVers and tent campers alike. Park model rentals are available. Located on the shores of Lake Havasu on pristine white sand beaches, the park offers panoramic views of the lake and mountains. The perfect location for RV or tent camping.